Crusty, chewy and soft – this no-knead method of making bread is so easy with results that will rival a bakery. Homemade bread is magical. 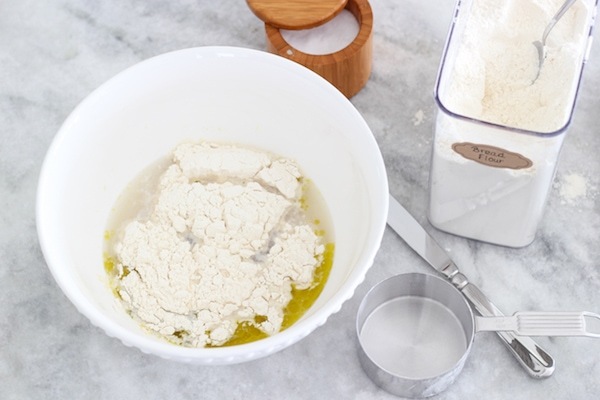 With a handful of very simple ingredients, and just a large mixing bowl, a wooden spoon and some muscles, you can mix up the dough, set it aside to rise and go about your business. 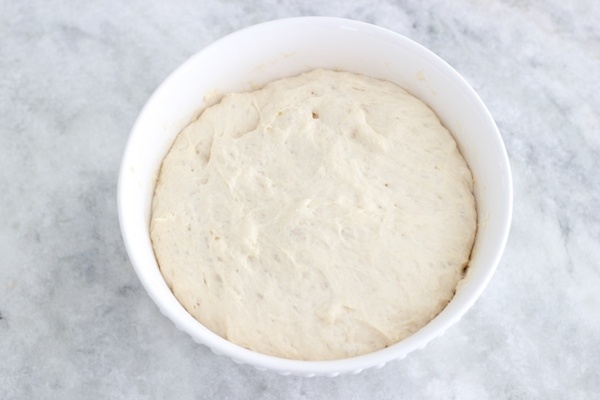 There is no kneading involved and shaping the dough into a loaf takes just a minute or two. The bread has a crusty and golden exterior and is so soft and just a bit chewy. 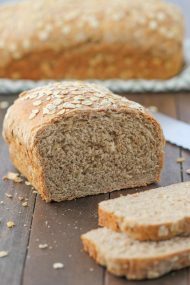 It is perfect to serve with a warm bowl of soup, as the base of a sandwich and fresh out of the oven is the best of all. There are so many versions of this recipe and this is the one I have loved using for the past few years. I use a bit more flour than most recipes call for which helps the loaf rise more instead of spreading out, resulting in a softer inside texture and most importantly, a taller, rounder loaf. Pour the warm water into a large bowl. Sprinkle the yeast into the water. Mix to combine. 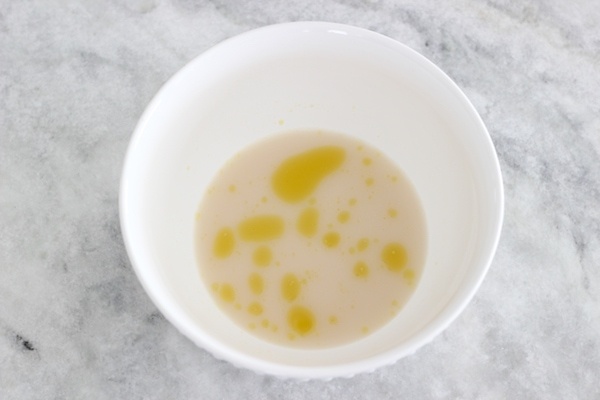 Add the olive oil. Add the flour, 1 cup at a time, adding salt along with the flour. 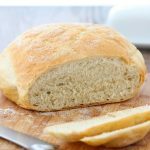 What Flour is Best To Use For Bread? 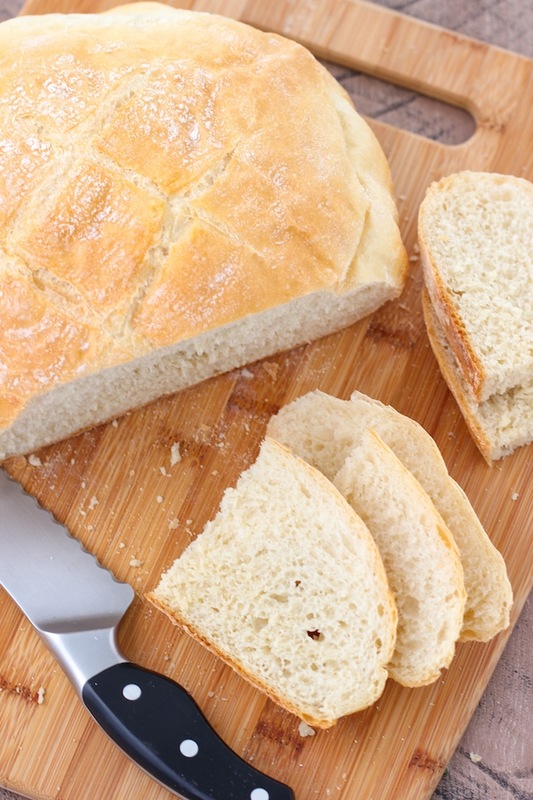 Bread flour is the best for this recipe, however, all purpose flour will work in a pinch. 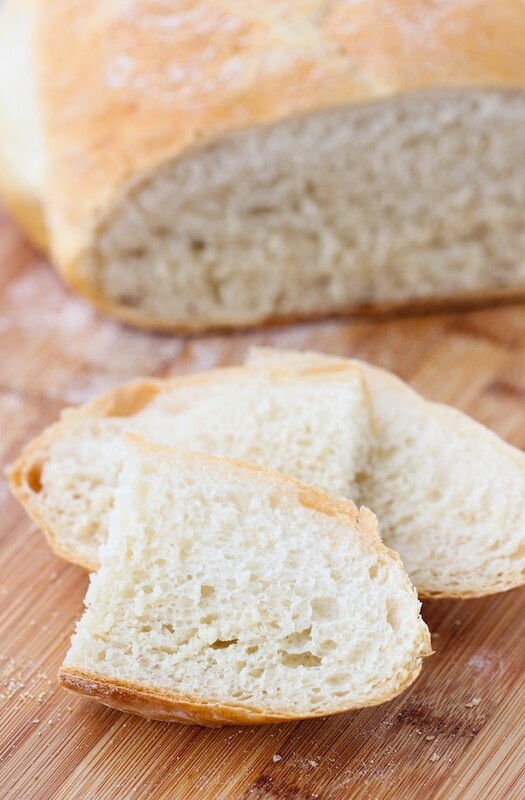 Bread flour has a higher protein content, which means it develops a lot of gluten and provides more structure for the bread and makes it more chewy. I also use a bit more flour in my recipe for No-Knead Bread than most other recipes I’ve tried, and it helps the bread rise better, makes the loaf softer and not as spread out. 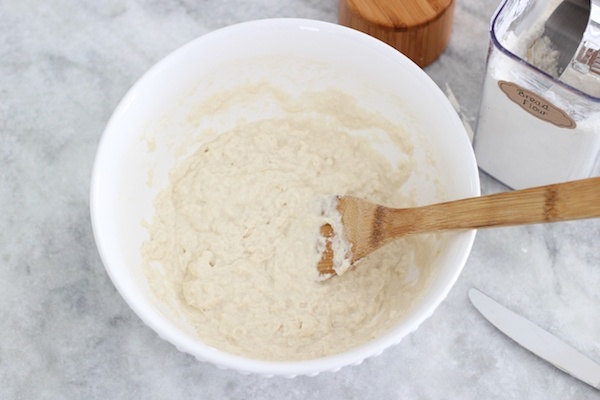 Mix with a large wooden spoon until all the flour is incorporated. Cover the bowl with plastic wrap or a kitchen towel. Set aside to rise until double in size, 45 min – 1 1/2 hours, depending on how warm your house is. Place a piece of parchment on the counter and sprinkle the center with some cornmeal. The cornmeal is optional. It will give a nice crunch to the bottom of the bread. 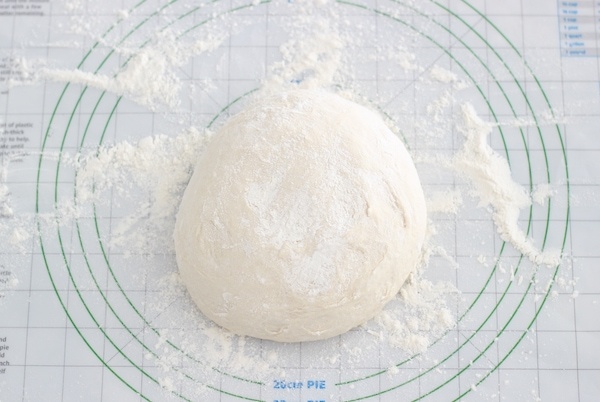 Set aside until you shape the bread dough. Fold the bread in half and then again in half. 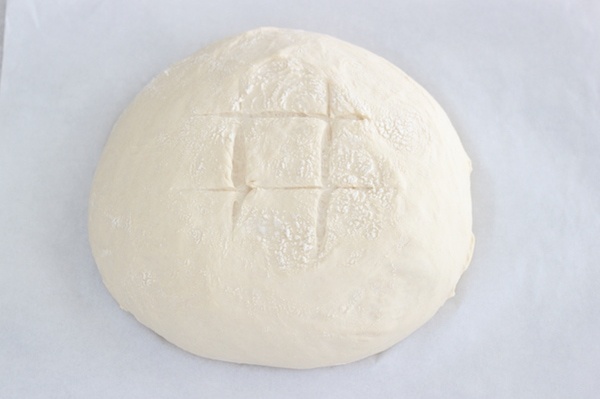 Shape dough into ball. Sprinkle the top with more flour. 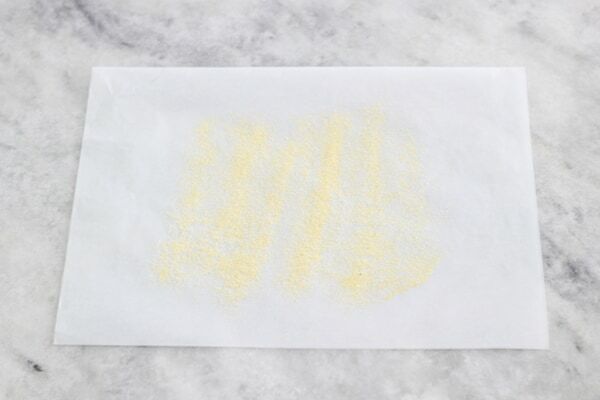 Transfer the shaped loaf of dough and place it onto the center of the prepared, cornmeal sprinkled parchment paper. Cover loosely and allow to rise at room temperature until double in size, another 45 – 1 1/2 hours, depending on how warm it is in your home. Preheat the oven to 425 degrees Fahrenheit. Place a dutch oven with the lid, a pizza stone or a large baking sheet into the oven to preheat along with the oven. I’ve used all of the above for this bread and they all work really well. 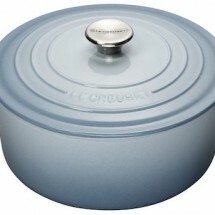 I prefer the dutch oven, but you can use a pizza stone or baking sheet too. 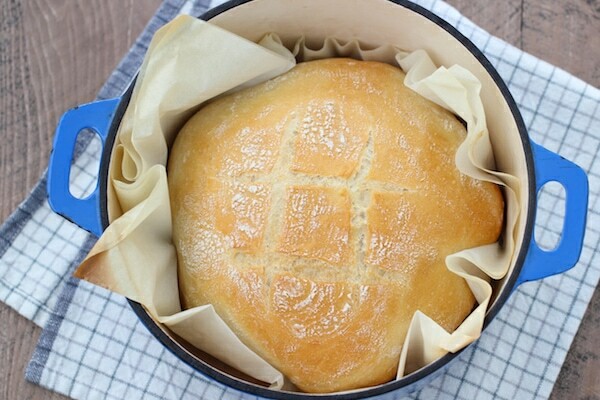 The bread will have the best shape and will have the most crunch if you use the dutch oven. 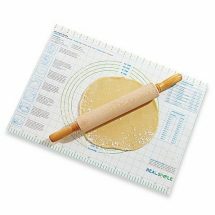 The pizza stone is another great option that I often use for bread. It will also make the outside of the bread crunchy, but it will spread out a bit more. 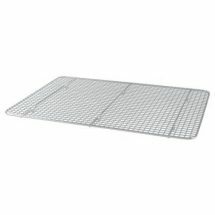 The baking sheet will also work, but the bread will not be as crunchy and will spread out more than when baked in the dutch oven. 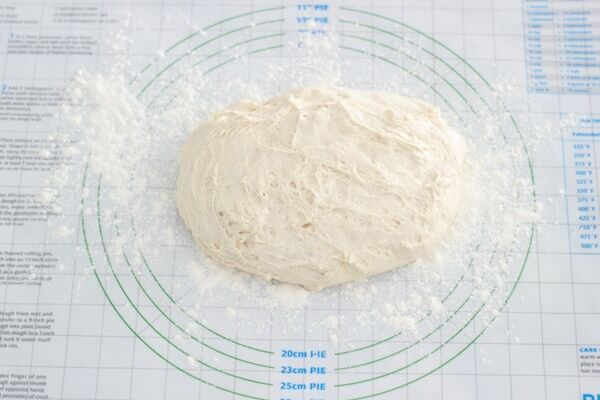 When the bread has doubled, use a sharp knife to slash an X or hashtag along the top of the dough. Slashing the dough will help the steam to escape so the loaf bakes evenly, without splits and cracks. Use the edges of the parchment paper to pick up the bread and lower it into the hot Dutch oven. Cover with the lid and return to the preheated oven. Bake the bread for 25-30 minutes, then remove the lid and bake for another 5-7 minutes, until the crust is as golden brown as you like. 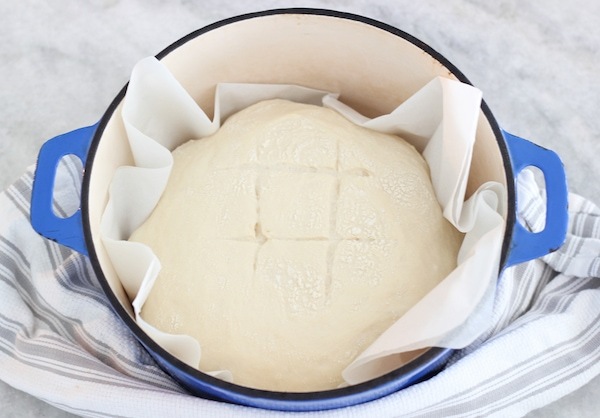 Remove the bread from he Dutch oven using the edges of the parchment paper and allow to cool on a wire rack. 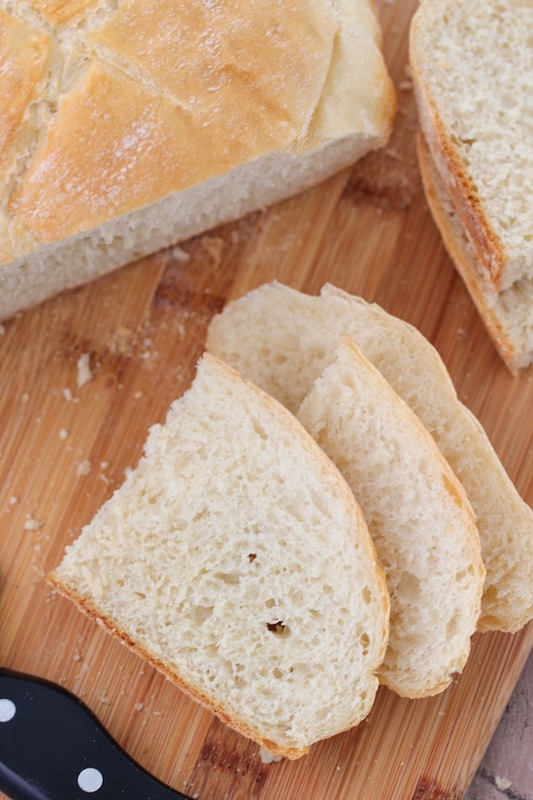 Store the bread at room temperature, in a paper bag or in a vented container. 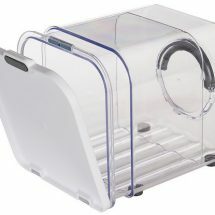 This is the bread storage container that I have. Bread freezes really well, so you can place it in a large freezer ziplock bag and freeze for up to 3 months. 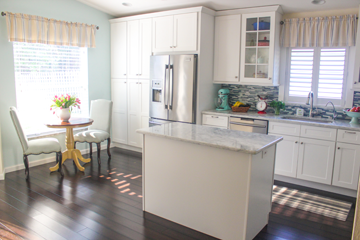 Remove from the bag, wrap loosely in a clean kitchen towel and thaw on the counter. 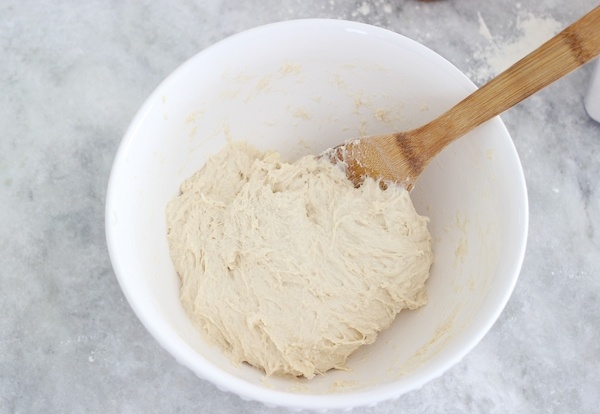 Mix with a large wooden spoon until all the flour is incorporated. 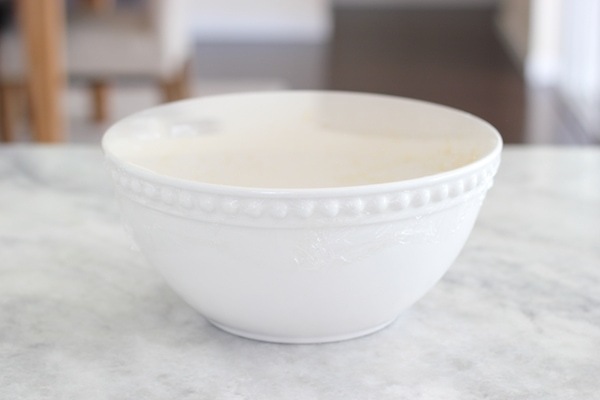 Cover the bowl with plastic wrap or a kitchen towel. Set aside to rise until double in size, 45 min – 1 1/2 hours, depending on how warm your house is. Place a piece of parchment on the counter and sprinkle the center with some cornmeal. The cornmeal is optional. It will give a nice crunch to the bottom of the bread. 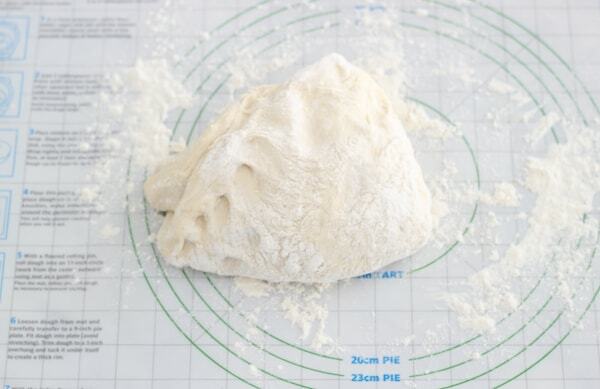 Generously sprinkle the counter with flour and transfer the risen dough onto the floured surface. Fold the bread in half and then again in half. 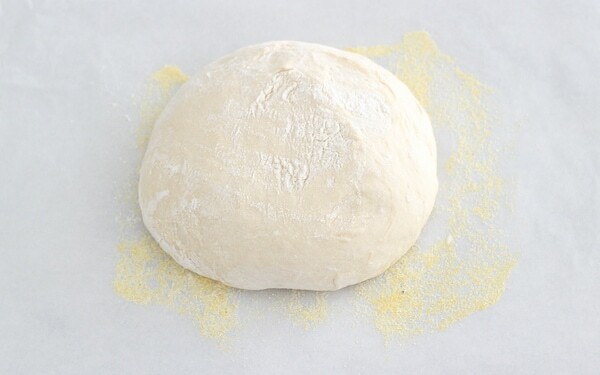 Shape dough into ball. Sprinkle the top with more flour. Transfer the shaped loaf of dough and place it onto the center of the prepared, cornmeal sprinkled parchment paper. Cover loosely and allow to rise at room temperature until double in size, another 45 – 1 1/2 hours, depending on how warm it is in your home. 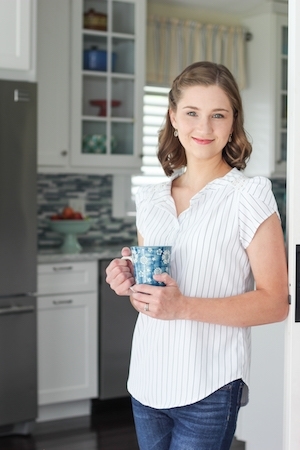 Hi, do you think whole wheat flour will work for this recipe too? I have never tried it for this particular recipe. 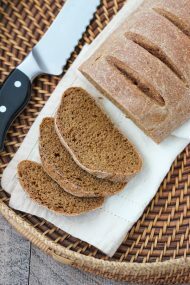 I would suggest using only part whole wheat flour and the rest bread flour or all purpose flour. This brear is very easy to make and it’s very delicious!! I love how simple it is to prepare too, Inna. Thank you for taking the time to write. Delicious!!! Recipe works great! 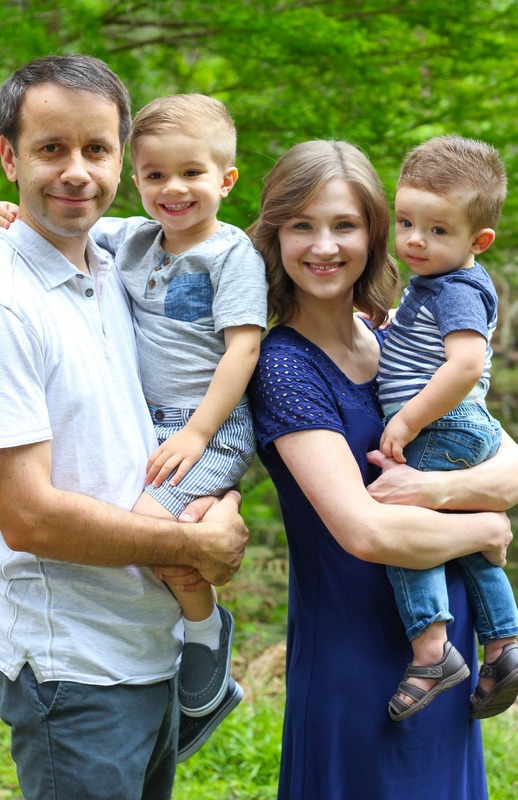 Thank you Olga! I’m happy to hear that, Ecaterina:). Just made this and I gotta say That this was the easiest bread recipe I’ve ever made and also so delicious 😋 thank you Olga for sharing this bread recipe !!!! I’m so happy to hear that you enjoyed it, Alena. Thank you for taking the time to write. Would a smaller Dutch oven work for this? The bread won’t fit into a dutch oven that is smaller than 5 1/2 – 6 quarts, Mariya. I’m so happy that you were happy with the bread, Smitha. Thank you for taking the time to write. A little bit less than 1 Tablespoon. 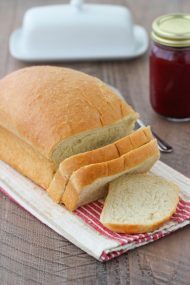 Im just wondering if it possible to double the recipe, it seems like not to big loaf of bread. It’s 9 1/2 – 10 inches in diameter. I would say it’s a good size, a bit bigger than most of the loaves that are sold in the store. 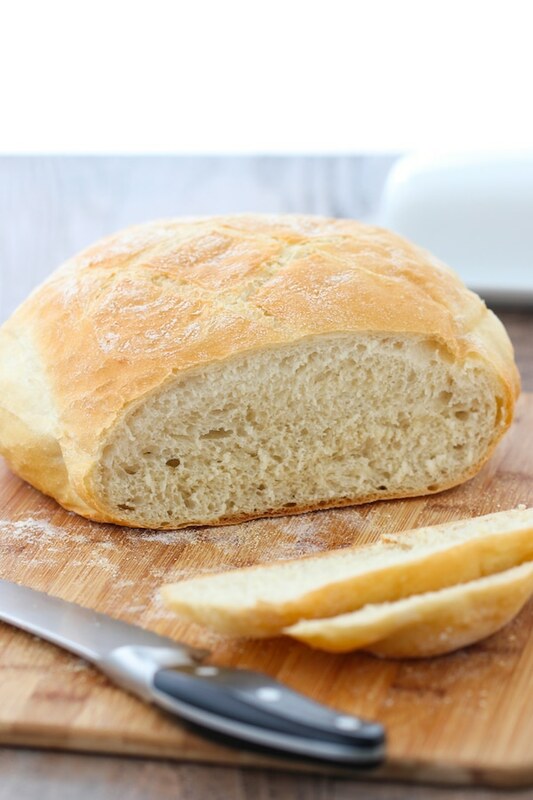 If you want to make it bigger, you will need to use a bigger dutch oven or a pizza stone to bake the bread and will need to bake it longer. Can you make this with Canadian flour? I have never used Canadian flour and don’t know what structure it has.